| The Story of Port Royal’s Traveling Red Buoy. The Story of Port Royal’s Traveling Red Buoy. This buoy is special. Why, you ask? Because this buoy has a history and a lot of miles on it. Once upon a time, it was afloat in Port Royal Sound and directed ships in the area. Then in 1970, a large strorm cut it loose. 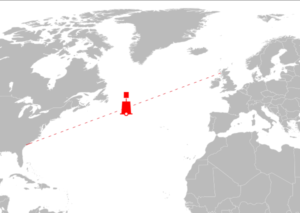 One year later, Port Royal’s Traveling Red Buoy showed up across the pond off the shores of Scotland. It was then recovered by a British vessel after a it took its 6,000-mile ocean trek. In 1973 it was towed to Port Royal via Charleston for the cost of $92.06, and then returned home by the Port Royal Clay Company. It sits on dry land near the corner London Ave. and 9th St. at Fraternal Order of Police Memorial Park. Port Royal’s Traveling Buoy is commemorated by a plaque that explains the its light is kept burning in dedication to all officers who’ve lost their lives in the line of duty. To learn more about the history of Port Royal history go to portroyalhistory.org.